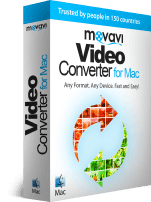 Mac OS X includes a number of useful default applications, one of which is iMovie. 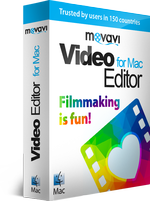 It’s a great app for creating and editing videos, but if it’s not a program you feel you would ever use, then it’s just wasting space on your Mac. Completely removing iMovie can give you back about 3 GB of space on your hard disk. Of course, the easiest way to remove iMovie from a Mac is to locate its icon in the Finder and drag the icon to the Trash. However, deleting applications this way often leaves behind support files like caches and preferences. 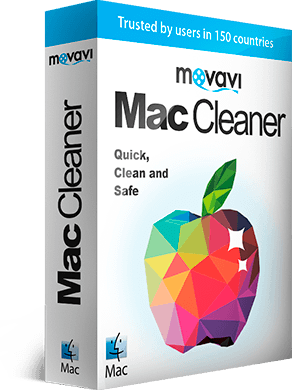 We recommend you instead use a dedicated application remover – Movavi Mac Cleaner! This app can simplify the uninstalling and carefully clear out all the files that are no longer needed. 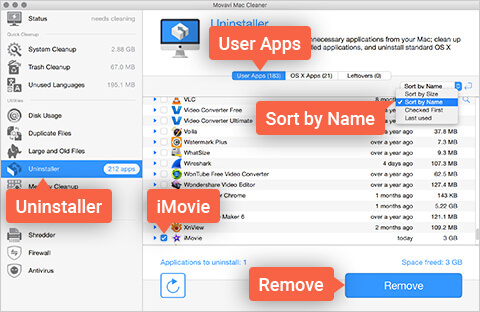 To learn how to uninstall iMovie safely and quickly, download Mac Cleaner and follow this simple program removal guide. Open the file you’ve downloaded and follow the installation instructions. After you launch Mac Cleaner, it will automatically scan your computer to find all the unnecessary cache and log files that can be safely deleted to free up disk space. To clean out all the junk in one click, use the Start Cleaning button. If you don’t want to remove junk at this time, move on to Step 3. First, open the Uninstaller menu. After Mac Cleaner builds a list of all the apps on your Mac, click User Apps. To sort the list in alphabetical order, choose Sort by Name in the field above the list. Locate iMovie, check the box next to it, and click Remove. That's all there is to it! 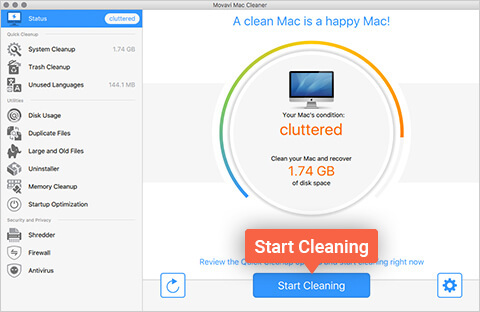 The best cleanup tool for every Mac user!